MOSCOW (AP) — A Russian lawyer who discussed sanctions with Donald Trump Jr. in New York during his father’s 2016 campaign for the U.S. presidency said Sunday that special counsel Robert Mueller has not contacted her yet. 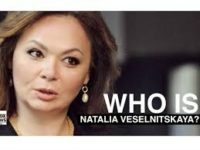 In an interview with The Associated Press, Natalia Veselnitskaya also detailed her recent meeting in Berlin with investigators from the U.S. Senate Intelligence Committee. Like Mueller, the committee is investigating allegations of Russian interference in the U.S. presidential election.